Bonner C. Upshaw III was a professional on the hardwood; now he’s in the corporate suite. Following Bonner C. Upshaw III’s college career, the Wyoming Wildcatters of the former Continental Basketball Association, a feeder league to the NBA, drafted the promising young player. Trouble was, he broke his hand and had to sit out the season. Undeterred, the following summer he joined the professional basketball league in Europe and, over a 10-year career, he started at both forward positions for teams in France, Switzerland, Macedonia, and Portugal. During the offseason he would return to metro Detroit, where he worked for an employee leasing firm in Auburn Hills — today known as a professional employer organization, or PEO. “The lesson for me, looking back, is that you can’t focus on one thing. 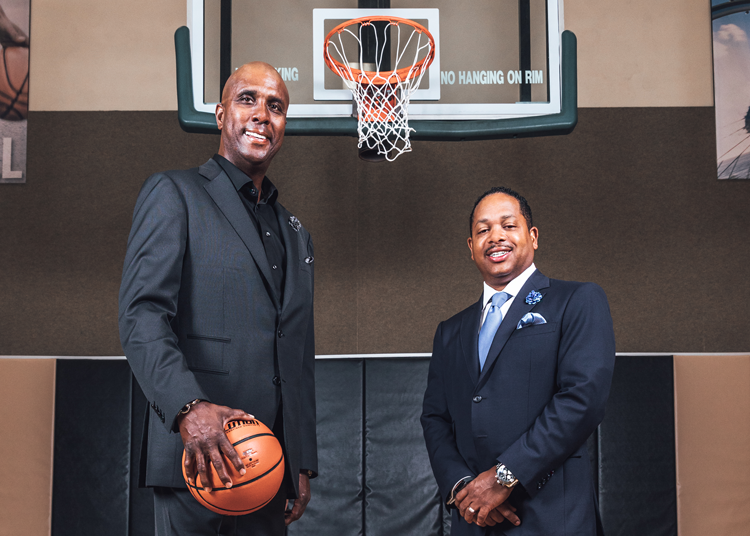 I couldn’t play basketball forever, and I wasn’t making the kind of money that NBA players do, so I needed a skill set beyond the hardwood,” says Upshaw, who, with David L. Stone, co-founded Trion Solutions Inc. in 2013. Today, the company is the largest minority-owned PEO firm in Michigan. The path from the basketball court to the executive suite wasn’t easy. During his time in Macedonia, the Serbo-Croatian War was raging eight to 10 hours from where he lived. “It was always on your mind that the war would get out of hand and come your way,” says Upshaw, who averaged 22 points, 10 assists, and four rebounds a game during his career. He found he also had to be on guard when it came to the financial aspect of his career. “In my first year I had an agent, and the standard deal was they would take 10 percent (of your salary). That was a lot of money, so I represented myself over the next nine years,” he says. After he retired from basketball in 1998, Upshaw worked for a time at the same PEO firm in Auburn Hills where he had spent his offseasons before founding his own company. In 2012, Upshaw and Stone, who ran his own workforce management firm, merged their two companies and formed Trion Solutions. The company offers a range of services, including payroll management, benefits administration, workers’ compensation, compliance management, employee administration, and other worker-centered activities. With 600 clients, today the company services 25,000 employees who generate a combined payroll of $560 million annually. “We allow our clients to focus on what they do best, and we take care of whatever they need in terms of human resources and other business activities,” Stone says. “For a small firm, it’s difficult to stay current on the changes in health care, with more changes likely to come.